After last week’s disappointing post-TakeOver episode, I tried to set my expectations up for this week knowing full well that the bigger names on the roster would appear on this show. With advertised appearances by the new NXT North American Champion Johnny Gargano and NXT Women’s Champion Shayna Baszler, not to mention Bianca Belair and the Sky Pirates in the main event, this night’s card was definitely stacked in terms of star power. By default, it was a good show. I feel it could have been better but as I’ve stated in the past, Marina Shafir and Jessamyn Duke are two names that don’t seem to belong in the main event yet. 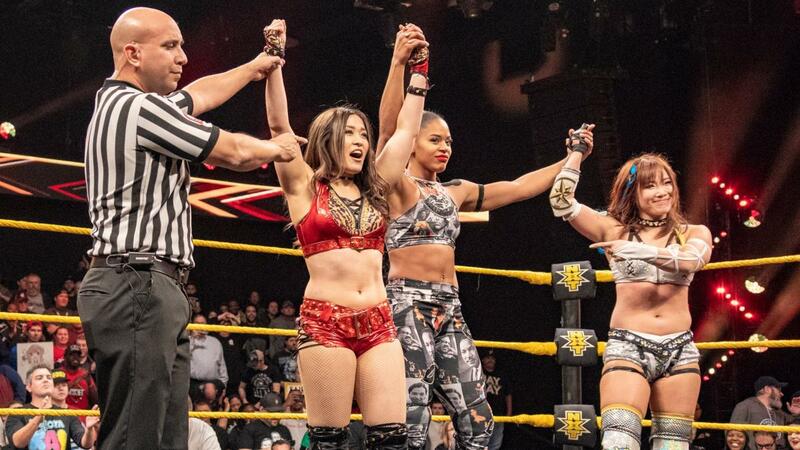 I get the fact that they’re aligned with the NXT Women’s Champion, hence, the need to be involved in high-profile matches but even with the combined efforts of Io Shirai, Kairi Sane and Bianca Belair, Duke and Shafir seemed lost and out of place at times. The crowd wasn’t too shy in expressing their displeasure for the inexperienced duo as chants would be heard all over Full Sail requesting for Shayna to be tagged in the ring. Even various people within the Smark Henry offices were vocal on how Shafir and Duke were green as performers. I feel they’d need to be exposed to less noteworthy opponents in the meantime so they can work on their craft. As expected in an almost star-studded match, the women did not disappoint. Anytime you get Io Shirai and Kairi Sane in the same match, you know you’re in for a treat as both women stole not just the match, but the whole show. Belair was as fun to watch as well and you could see how comfortable she is being herself in the ring. Even Shayna would have her share of good moments and spots which made the whole thing gel perfectly. It’s pretty interesting though that they chose for Shayna to eat the pin which sets up a slew of opportunities to develop the storyline. The show closed with Belair feeling as if the Sky Pirates had stolen her spotlight albeit still raising their hands in victory. It feels like we’re leading up to either a Bianca Belair vs. Io Shirai lead-up or maybe even a three-way dance for the NXT Women’s Championship. The wishful thinker in me hopes that they turn it into a four-way battle so that we can include the former champ, Kairi Sane, in the mix for the title hunt. Nonetheless, whatever they choose to build up to, it could spell the end of Shayna Baszler’s reign. Johnny Gargano may have won the championship, but his interaction with the Dream elicited some faint jeers and boos along with the “Johnny Jackass” chant. If Johnny thought he could go back to being babyface Johnny Wrestling with this promo, then clearly the crowd seems to think otherwise. What the hell was Dream wearing? He looked like an eccentric fortune-teller. Jaxson Ryker is getting the “monster push” treatment to help build him up. I'd like to see him take on bigger names next time though. Adam Cole will face Ricochet again next week. It was fun before, but what’s next for both of these talented lads? Mark my words, Eric Bugenhagen will be big. He’s got a look that’s interesting and fun. Maybe the gimmick isn't main event material, but it has potential. I just hope they don’t turn him into an Adam Rose. Just look at him here. Matt Riddle/Drew Gulak was fun to watch. Gulak could have a regular spot in NXT and he'd fit in. He looks like the type who’d produce good matches with a lot of the roster. Ditto on Riddle as well. We need more of this. Check out Bianca Belair’s attire. She’s been busy designing her gear and she’s knocked it out of the park with her fashion choices. What did you think of this week's episode? Did you enjoy Eric Bugenhagen's antics? How do you think the NXT Women's Division contendership will pan out? Share your comments and speculations at the comments section below.